You will LOVE exploring Caribbean dive destinations, Caribbean wreck diving, ocean life and conservation efforts in the region along with us. Like scuba diving? Do you enjoy exploring the reefs in the Caribbean? Create your own page, add your special photos and tells us about your favorite Caribbean destinations and dive adventures. Wondering where to stay in the Caribbean? Which country ?....How about the dive resort, dive center or beach restaurant? 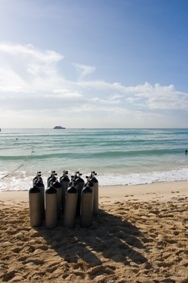 Find a dive service click here! You can find a growing listing of resources for diving and accommodation. This should make your next dive trip a little easier! If you are interested in conservation, we'll take you there too! We believe in conserving our Caribbean coral reefs and marine life. Without its rich eco-system, this website would not be possible. You may even fall madly in love with the Caribbean and decide to turn your passion for diving into a full time career. Keep up with the latest about Caribbean dive vacations. We'll be updating and growing this site with more and more Caribbean diving experiences here. Please subscribe to my monthly e-zine so you don't miss a thing. We strive to have Caribbean Travel dive interviews from perconalities that are impacting on Caribbean scuba diving scene. This Caribbean scuba diving forum is your place to join about your experience diving around the islands of the region. The Caribbean SCUBA Blog keeps you up-to-date with all additions and changes to the caribbean-adventures-and-dive-vacations.com Web site. Subscribe here. Our Caribbean directory of scuba diving services allows you to search our growing database to find Scuba diving centers, resorts, charters, dive operators and villa owners in the Caribbean region. The e-zine for lovers of Caribbean Scuba Diving, or those who'd love to learn more about them... and about this beautiful hidden gems of a Caribbean diving. 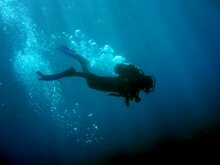 Go scuba diving Cozumel Mexico to get a full experience diving in the Caribbean. Dive Grenada and get a look into some of the most pristine waters of the Southern Caribbean islands. You are thinking of going on a Tobago vacation. With lots of Tobago hotels to choose from and of course Tobago scuba diving. With frequent flights to Tobago, pick from among the resorts and villas. Not all sharks are found in the tropical waters of the Caribbean but quite a few different types of sharks reside in the region. A spotted eagle ray caught my eye while snorkeling at Goodman's Bay, Nassau, in the Bahamas. They say the largest brain coral can be found at Kelleston Drain, Speyside Tobago. There are Tobago hotels and accommodation for divers all over the island of Tobago. From the south to northern side of the island. There are quite a few Tobago resorts on the island. When you return from a full day of diving you may want to unwind by being pampered to get ready for move dives the following day. There are lots of watersport things to do in Aruba. From snorkeling, scuba diving to submarine adventures. Advertise on a Caribbean scuba divingn website reach thousands of visitors interested in the islands. How do Antigua dive vacations compare to Barbuda? Here is your chance to let us know what your thoughts! Experience Barbados scuba diving through the eyes of other divers to the island. Diving in Belize is nothing less than fabulous, here you can get closer to scuba diving in the deep blue. What's more exciting than scuba diving in Bonaire? With world class scuba diving in Brazil, it is understood why many flock to the coast for great underwater adventures. Discovering scuba dive sites Curacao, some of the best diving spots in the Caribbean. Scuba diving Dominica Republic gives you your underwater and adventure fix. Scuba Diving Tobago Extra Divers, book your dive travel in the Southern Caribbean. Would you like to share your knowledge about scuba diving? Great, find out how you can submit your story or tip here.